After a few quiet and relaxed days here in Panama City Beach – it’s now starting to feel a lot more like Ironman! A few more specks out there in the Gulf polishing off their strokes..
And a lot more running shoes pounding the pavement in the hot Florida sun to work out the final kinks. And we can’t forget my friend Juliette who has finally arrived safe and sound! 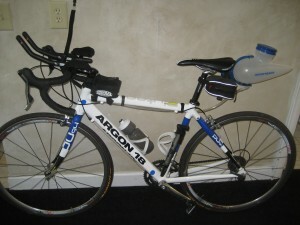 Thanks to Tribike Transport, my Argon 18 has arrived intact from Seattle after a 2 week road trip across country. Apart from having to spend a day driving down to Seattle to drop off/pick up my bike on either end of the race – the whole TBT system is pretty sweet. No dismantling, no worries about your bike getting lost on an airplane.. and friendly service to boot – so pretty top notch. Plus they tell me there may be a partner shop opening up in Vancouver next year, to service the new course addition to the IM circuit – Ironman Tremblant – fantastique! After registering, IronDad and I took our equally intact bikes out on course for just under an hour.. and it felt good. Really good. And the BEST part was my new birthday present/triathlon toy – which if used to it’s full potential – will keep me away from the hospital this time around. IronDad picked me up a handy little ‘Never Reach’ hydration system – which already proved it’s competitive advantage after I guzzled 32oz’s of Gatorade without even thinking about it! My new issue will be all the bathroom trips.. but a good issue to have I think. And if my two older brothers are reading this, you’ll have to reconsider your bets since a hospital visit due to dehydration is now unlikely to be in the cards… sorry about that one! So – it’s all starting to feel real. Getting here a week ahead makes such a difference. No frantic rush to put all the pieces into place.. an opportunity to enjoy some nice dinners with pops… and a chance to work out any last minute kinks. Now – let’s get this thing going! This entry was posted in Cycling, Daughter's Blog Posts, Ironman, Ironman Florida. Bookmark the permalink.